This Processing and Treatment Standard contains the minimum requirements and process limitations for treating wood products under the AWPA Standards. This includes conditioning of material for treatment, treatment processes and limitations, end-results of treatment, post treatment handling, and quality control applicable to all commodities treated under the AWPA Use Category System. 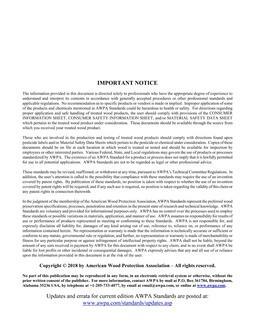 It should be used in conjunction with the AWPA Standard U1 "Use Category System: User Specification for Treated Wood", which lists the retentions for commodities and their appropriate exposure conditions. Treating practices and results shall be in compliance with all AWPA Standards including: "P" Standards which detail accepted AWPA preservative chemicals, "A" Standards that contain analytical methods to quantify and monitor preservative treatment practices and wood products, and "M" Standards which are miscellaneous standards. Processing requirements specific to individual commodities listed in the Commodity Specifications in Standard U1 are found in the Commodity Sections of this standard. This standard uses SI (i.e., metric) units. US Customary units are soft conversions and are for information only.